Janusz Wawrowski is Polish violin virtuoso and Warner Classics artist. He graduated from the Chopin Univeristy of Music in Warsaw, where he studied under professor Mirosław Ławrynowicz. Later he mastered his skills under Yair Kless and Salvatore Accardo. Wawrowski has performed at the Berliner Philharmoniker, Musikverein in Vienna, Piotr Tchaikovsky Conservatory in Moscow, National Philharmonic in Warsaw, De Doelen Concertgebouw in Rotterdam, Tel Aviv Music Center, Teatro Teresa Carreño in Caracas and many others. He also participated in number of reputable festivals, such as Salzburger Festspiele, Festspiele Mecklenburg-Vorpommern, Chopin and His Europe Festival or Transatlantyk Festival. 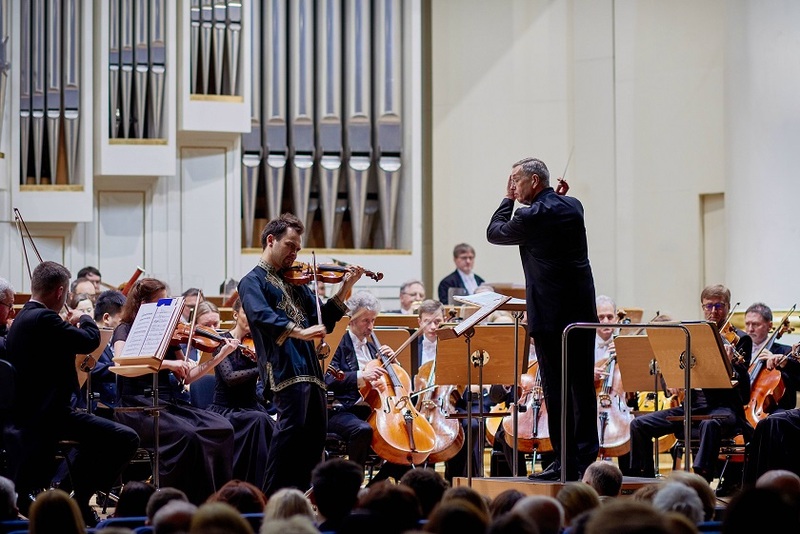 Janusz Wawrowski has appeared as soloist with Warsaw Philharmonic Orchestra, Lithuanian National Philharmonic Orchestra, Sinfonia Varsovia, Polish National Radio Symphony Orchestra Katowice (NOSPR), Polish Radio Symphony Orchestra (POR), Südwestdeutsche Philharmonie, Stuttgarter Philharmoniker, Simón Bolívar Symphony Orchestra in Venezuela and many others, under such conductors as Conrad van Alphen, Łukasz Borowicz, Gabriel Chmura, Jacek Kaspszyk, Jerzy Maksymiuk, Mykola Diadiura, Tomáš Netopil, Agnieszka Duczmal, Juozas Domarkas and Antoni Wit. Janusz Wawrowski premiered several contemporary violin concertos: Vivaldi Recomposed by Max Richter (Polish premiere), The Four Seasons by Sukhi Kang (Polish premiere), L.A. Concerto by Tomasz Jakub Opałka (world premiere performance) and Óneiros concerto by Dariusz Przybylski (world premiere recording). Collaborating with Oscar-winning film music composer, Jan A. P. Kaczmarek, Janusz Wawrowski premiered and recorded music for Hollywood films – Evening (directed by Lajos Koltai) and Get Low (directed by Aaron Schneider). Being still a student, Janusz Wawrowski acquired a unique skill of performing all the famous 24 Caprices by Paganini in one concert evening. In 2007 he recorded his first CD, Niccolò Paganini 24 Caprices Op. 1. Wolfgang Marschner observed that his performances may be compared with the playing of “only few distinguished European violinists.” Famous Polish violinist, Konstanty Andrzej Kulka wrote: “the very fact alone of being able to perform all the 24 Caprices inspires admiration and earns appreciation. The style in which Mr. Janusz Wawrowski plays the Caprices makes us optimistic as to the future of the art of violin in Poland.” And the great Ida Haendel stated: “In my opinion, Mr. Janusz Wawrowski is a violinist of outstanding quality, who deserves a fine career on the concert stage“. Due to its success and popularity, this album has been recently re-released (Warner Classic 2016). In 2013, Janusz Wawrowski signed a multi-album contract with Warner Classic. The first result of cooperated work – Aurora album with music by Szymanowski, Lutoslawski, Ravel and Ysaÿe received excellent reviews in international press (Strings, The Strad, Pizzicato and Huffington Post) and was nominated for the Fryderyk award 2014. In Autumn 2016, Janusz Wawrowski's released Sequenza which explores violin solo repertoire of the twentieth and twenty-first centuries, with the music by Ysaÿe, Brustad, Penderecki, Bacewicz, Berio, Opałka and Przybylski. Sequenza received outstanding recognition by the press including a 4* review by the Guardian and live performance in the BBC Radio 3. The album was awarded Fryderyk 2017 prize by the Polish Phonographic Academy. Hailed by the press “an authentic and deeply compelling advocate for the music of Poland” (Huffington Post), Janusz Wawrowski is a keen explorer, performer and editor of missing or forgotten works by Polish composers, including Mieczysław Karłowicz, Karol Lipiński and Zygmunt Noskowski. In 2013 he was chosen to take part in the photography project by Ukrainian artist Stepan Rudik featuring outstanding Poles whose artistic activity has left a significant trace in the world. Among them were Krzysztof Penderecki, Wojciech Kilar, Olga Pasichnyk, Andrzej Wajda, Krzysztof Zanussi and Agnieszka Holland. As “a virtuoso of the highest order”, he has performed for three Presidents of the Republic of Poland and for the President of the European Commission José Manuel Barroso. In recognition of his artistic achievements, Janusz Wawrowski was awarded Decoration of Honour “Meritorious for Polish Culture” by the Ministry of Culture and National Heritage. Janusz Wawrowski plays on the Stradivari 1685 violin, thanks to Futurenet – Mr Roman Ziemian and Stephan Morgenstern. It is the first Stradivari violin in post-war Poland. [read more about Stradivari 1685] Janusz Wawrowski's new Warner Music album, Hidden Violin features works for violin and piano by Polish composers. Wawrowski has recorded this CD together with José Gallardo to celebrate 100 years of independence of Poland. Janusz Wawrowski proves that music perceived as difficult can be listened to with an authentic pleasure (…).„Aurora" is absolutely gripping and definitely worth recommending even to those who are not convinced to XXth century music.